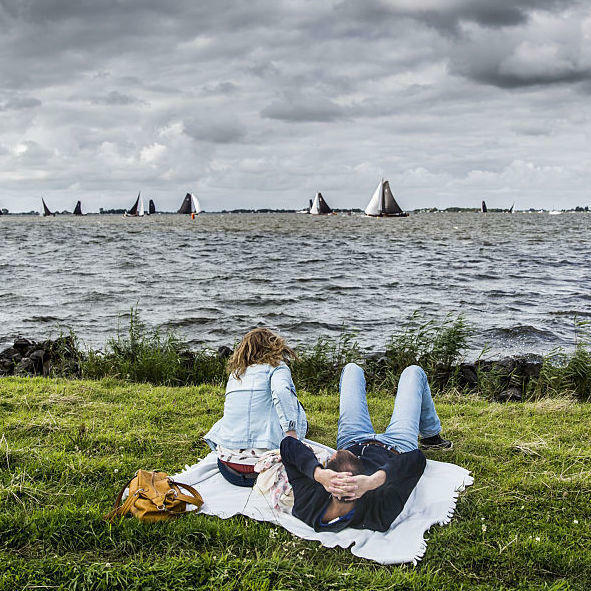 People at leisure watch boats taking part in the sixth race of the Skutsjesilen competition, a traditional boat race of sailing yachts from several Frisian cities, in Elahuizen, on August 5. #NPRreads is a weekly feature on Twitter and in The Two-Way. The premise is simple: Correspondents, editors and producers from our newsroom share the pieces that have kept them reading, using the #NPRreads hashtag. Each weekend, we highlight some of the best stories. I have liked Maria Popova's clever curation of knowledge worth considering on brainpickings.org for a while; I don't always manage to read the weekly newsletter, but when I do, I end up with a new angle on familiar topics. Last week, I found myself reading about leisure, something I struggle with (paradoxically): as an admitted Type-A person, if I can't optimize, measure, or manage an activity, I find it hard to engage with – and trying to optimize leisure often leaves me doing more much work in the pursuit of "relaxation." What kept me reading this week was Popova's article on the thoughts of Josef Pieper, a German philosopher, whose 1948 book Leisure, the Basis of Culture traced three key aspects of work: activity, effort, and social contribution – and how they help us learn the difference between leisure and taking a short break from work. I'm still learning how to "be at leisure" as opposed to "vacationing," but now my Type-A self has a new and more relaxed goal to shoot for. Back in the old days, if you wanted a toasted bagel, you would have to roast it over a fireplace or a stove. Of course, back then you'd probably also have to make the bagel from scratch, too, but that's neither here nor there. As detailed in this excellent history of the modern toaster, from the breakfast site Extra Crispy, the journey to make the perfect piece of toasted bread was a long one. The first automatic pop-up toaster, which could brown both sides at the same time but had a timer so it wouldn't burn, wasn't introduced until 1925 by the Waters Genter Company. The article, which includes some great morsels of information from the Toaster Museum Foundation (which is a thing that apparently exists), also counts down some of the previous decades' fleeting toaster trends, like hippie print colors, coffee-machines-and-toaster combinations, and the specialized bagel toaster. "There's a real emotional appeal to the toasters, you know? More than some other practical appliances in the kitchen," says Jeanine Head Miller of the Henry Ford Museum. After all, what other kitchen conveniences got their own animated movie? Like many people, I wanted to know why the Uber driver in Kalamazoo, Mich., who was charged with shooting and killing six people in February, did it. Why would someone just suddenly decide to murder six people? Why?! You toss ideas around in your head – a mental break maybe? — trying to make sense of what is often inexplicable. In his GQ piece, writer Chris Heath tick-tocks Dalton's day, tracks down people who worked with him, lived near him, and did business with him trying to form a picture of who this man was, looking for clues that may have foreshadowed what happened that Saturday. He also scoured police reports, pulling together the explanation that Dalton offered reluctantly during interrogation: his phone told him to do it via the Uber app. Which, for me, raises more questions than it answers. Ultimately, we may never know why Dalton may have done it. I am guessing knowing doesn't make anything better for the people who lost loved ones that day. Three years ago, I went to La Moneda in Santiago, Chile. It's the site where on Sept. 11, 1973, tanks and the air force attacked the sitting president, Salvador Allende, a democratically-elected Marxist. The coup was successful, and Gen. Augusto Pinochet ruled the country in a totalitarian dictatorship until democracy was restored in 1990. In neighboring Argentina, the country experienced its own military dictatorship between 1976 and 1983. As many as 30,000 political opponents were killed or "disappeared." What happened in both of these countries involves one man here in the U.S.: Henry Kissinger. Human rights activists have for decades accused Kissinger, the former secretary of state and national security adviser in the Nixon and Ford administrations, of complicity and even support of the campaign of terror against leftists in Latin America in the 1970s. Recently-released documents give more credence to these allegations. The New Yorker's Jon Lee Anderson writes that the "latest revelations compound a portrait of Kissinger as the ruthless cheerleader, if not the active co-conspirator, of Latin American military regimes engaged in war crimes." The article is a reminder of some U.S. foreign-policy history, and why still today the Nobel Peace Prize-winning Kissinger remains so controversial. Understanding where people live — and why they choose to live there — is integral to how we design, place and even integrate schools. NPR Ed published a story this week about the 50 most segregating school boundaries, and the conversation about school integration is happening more and more. This story is especially interesting given that context.